Fleece is extremely versatile. Everyone should have a custom fleece jacket in their wardrobe. However, there are many factors to consider when choosing your custom fleece jacket. Here are some things to consider. Fleece is a synthetic fiber that is manmade and is usually 100% polyester. Since fleece is so versatile, it can be made into just about any type of clothing. This includes jackets, pants, and tops. Fleece clothing is ideal for weather that requires you to wear layers. The synthetic fibers used to make fleece are also long-lasting and work to trap the heat. Additionally, fleece clothing is usually made with diverse weights and features which make fleece perfect for many different situations and purposes. Microfleece is thin and lightweight. It is great for more mild winter weather. Microfleece provides insulation that is comfortable and breathable at the same time. This is perfect for individuals who are regularly active. Mid-weight fleece is the most common type of fleece and is perfect for everyday use. It is also great for a variety of activities. Mid-weight fleece comes with a high level of insulation and also creates a comfortable fit. This is perfect for outdoor activities such as hiking or climbing. Custom fleece jackets usually have either a half or a full zipper. A half zipper extends down the neck and ends just over the chest. This type of jacket must be pulled over your head to be worn, as opposed to a full zipper which can be taken on and off with ease. One useful feature is the chin guard, the fabric that covers the zipper. This feature is important because it protects your skin from being caught in the zipper. It also helps fight cold wind and weather by preventing the cold from seeping in through the zipper. Another useful feature of custom fleece jackets is the chest pocket. These are ideal for storing small objects such as your keys. They are also a great place to put your phone. When a fleece jacket is anti-pill, it means that it has been specially treated to stop balls of thread from appearing along the surface. This usually occurs during the wash and dry cycle. Having a custom fleece jacket that is anti-pill will help your jacket to last longer and stay looking fresh and new. You’re likely ordering a custom fleece jacket because you want to be able to create the specific design you’re looking for. So be sure to choose a company that can give you what you want. Some companies limit the degree of customizing you can do. Instead look for a cut-and-sew business that will make your jacket from scratch to your specifications. There are many things to consider when choosing your custom fleece jacket. You should think about the level of style and comfort that you desire. You should also think about what it will be used for and what type of weather it will need to protect against. 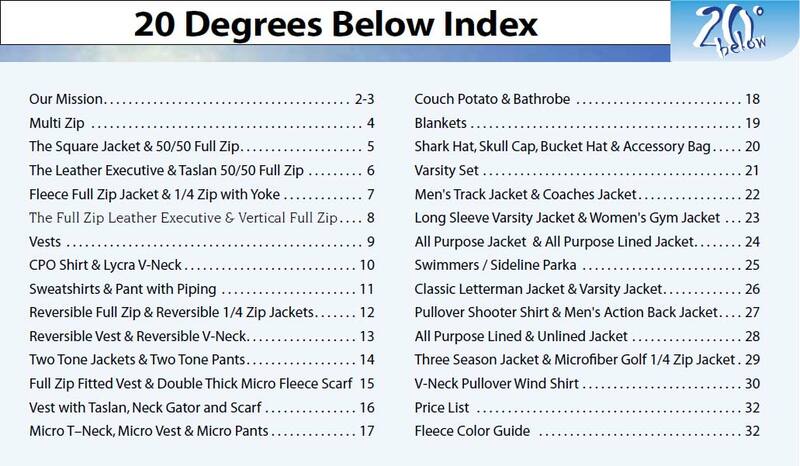 If you’re looking for the best in custom fleece jackets, visit 20 Degrees Below today!